This little beauty is one of my longest running film point & shoots. 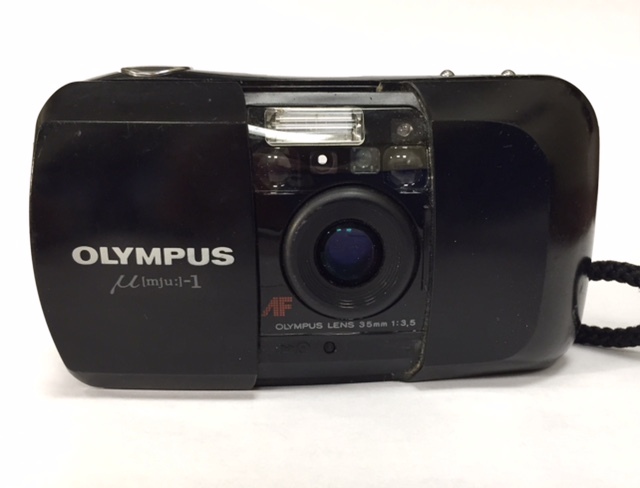 The Olympus MJU was the first in a series of the line. First produced in 1991. In NA it was branded as the Stylus. I got this one while living in Hong Kong, so there is no Stylus branding. This camera got used for years. I put it away a few years ago when the digital bug hit. The camera got put back into service this year when I reactivated my film interest. This guy was right there ready to go. All I needed to do was replace the battery. I used this camera A LOT. There's nothing to set on this camera. Just load the film, open the lens cover slide and press the shutter release. This is a rangefinder camera with the view finder right over the lens. There is limited / no parallax issue. The lens is a super sharp Olympus lens at 35mm f/3.5. Not the fastest lens in the world, but there is an automatic flash that goes off when needed. Two buttons are available for self timer & for turning on/off the flash. The camera is small, a bit chunky but fits perfectly in your hand. The lens cover slides open very easily with one hand. Once open the lens pops out about 1/4 of an inch and you are ready to go. That's it. I've really enjoyed this camera and will post some photos when the roll currently in it is developed.